Manage stress and personal expectation. Look after my body's needs through rest, nutrition and exercise. Do not spend unnecessary money. This is always a tough one - I love shopping and always have an eye out for pretty things. I loved this post from Kelly on planning a no spend month. This list stays the same most of the time as it reflects back to what I set out for the year in January. Complete final elements from spring clean - wardrobe, office and donations. Work on personal projects - recipe book (a file or book to house recipes from mags etc) and project notebook. As mentioned Little Red Moose is one of my main inspirations at the moment. Kelly's blog and Instagram are so lovely to look at! Alba's Universe is another blog full of Filofax sharing. I also spotted these pointers on her blog: A quick reflection on living - handy to keep in your diary or planner. Honey We're Home is a new blog discovery. 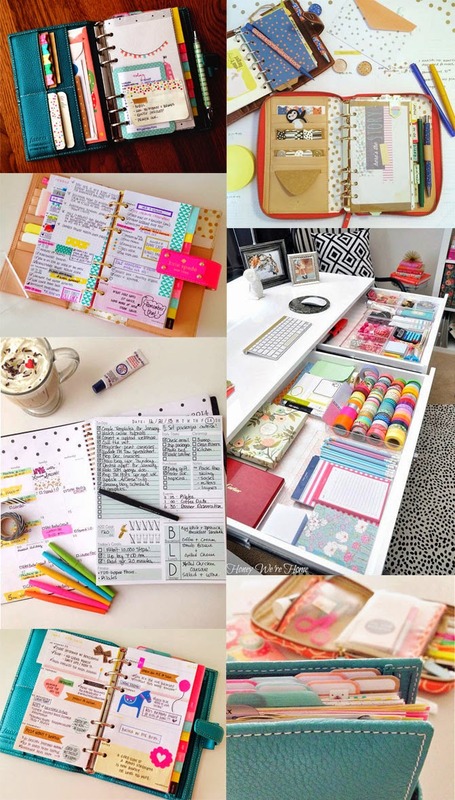 An organised office is a must for feeling on top of both planning and also it inspires you to want to be within the space. Take a look at Megan's desk here. On the left-hand side of the desk is a lovely picture showing a notepad - this is from Thyme is Honey. She created a host of useful resources which are for sale in her Etsy shop. What are a few of your favourite organising tools? Mine are highlighters, washi tape and my Frixion pens (just in case I make a mistake). Good luck for your week and of course for May! *See more planning and Meet Free Monday posts here. I started cleaning out my studio last week and even though I did a lot, I can barely see a difference. There's so much to do, but at least I've started.